The streets of Paris at any time of the year ooze chic style, sophistication and a certain ‘je-ne sais quoi’. During January, though, it is a bustling haven for designers seeking inspiration on emerging trends, new pieces and exhaustive conversations. Between both Deco Off, which in my eyes is Paris’ answer to Clerkenwell Design Week, and MAISON&OBJET, an ocean of exciting products displayed from a plethora of exhibitors, Paris in January is quite simply unlike anywhere else on the design globe. Despite the social unrest in France recently, more than 84,000 visitors from 160 countries dodged yellow vests when descending on to the City of Light for the 21st edition of MAISON&OBJET Paris. With each MAISON&OBJET fair traditionally exploring a key trend, this year’s exhibition pinned the Excuse My French! concept to the walls in order to challenge designers to highlight the Parisian influence, which is once again being felt across the world. The immersive experience offered in the Trend Forum set the scene for the unmistakably French art of cultivating paradoxes and twisting classics. It confirmed the creative excitement generated by French-made brands and a whole new generation of creators. 2,910 exhibitors in total where represented at the show, 603 of which were new exhibiting brands. Although it was impossible to have visited every stand, it was clear that on the surface there were common themes on what was expected to be popular in 2019. Nonetheless, each supplier pushed its limits to unveil to the world what was new in 2019. Above anything, it’s inspiring how ‘trend forecasts’ have been read but not necessarily adhered to. Here are a snippet of our highlights. 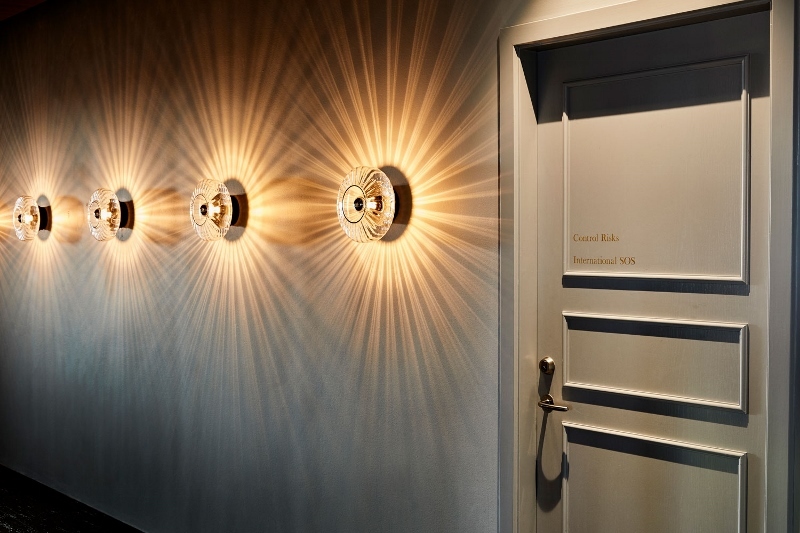 Combining functionality with decorative excellent, there were a number of lighting brands at the show that exhibited a range of innovative designs. Design By Us was among the leading exhibitors with its New Ocean Wave Optic Wall Lamp that provided a spectacular lighting installation, which glowed unapologetically outside its perimeters. Elsewhere in the show, attendees were drawn the elegant stand of Glammfire. 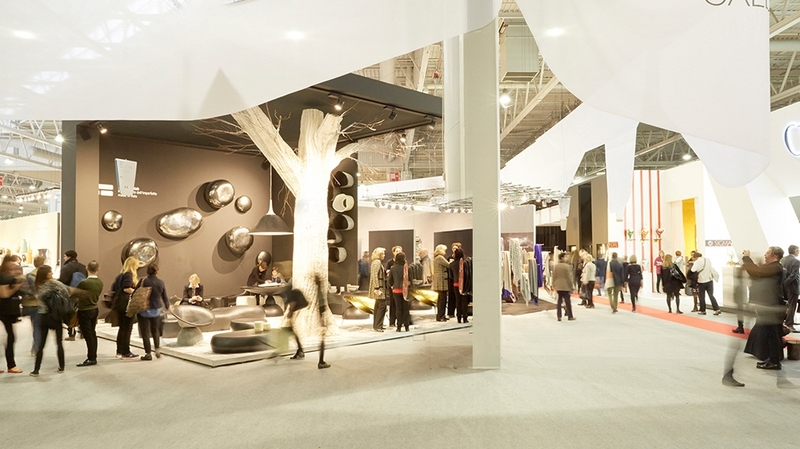 Its Thales pieces where centre stage of the stand, creating a dramatic ambiance. Whatsmore, the company also displayed the result of an interesting and colourful collaboration with artist Luio Onassis. With a sculptural design and simply charismatic, Thales is the world’s first suspended fireplace with a bioethanol automatic burner, designed from the drawing of a circle, is a versatile and adjustable piece that reveals the beauty of the integral view of the flame. 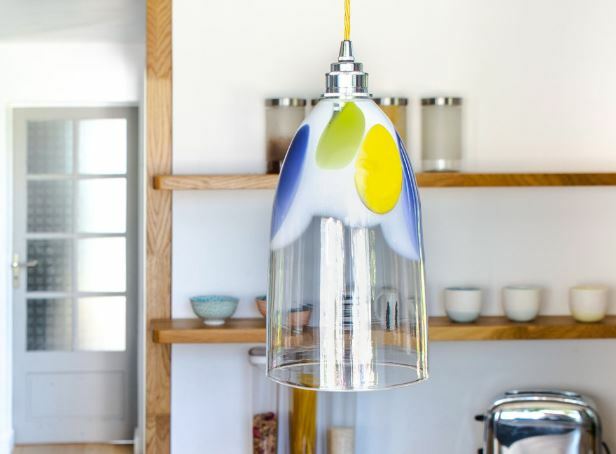 Husband and wife duo Verglass Luminaires exhibited bespoke lighting products such as Azur, Pop, Lotus and Cal. Established is 2007 by Scottish-born Julie Johnson and Eric Lemarie, there was a sense of personality on the stand. 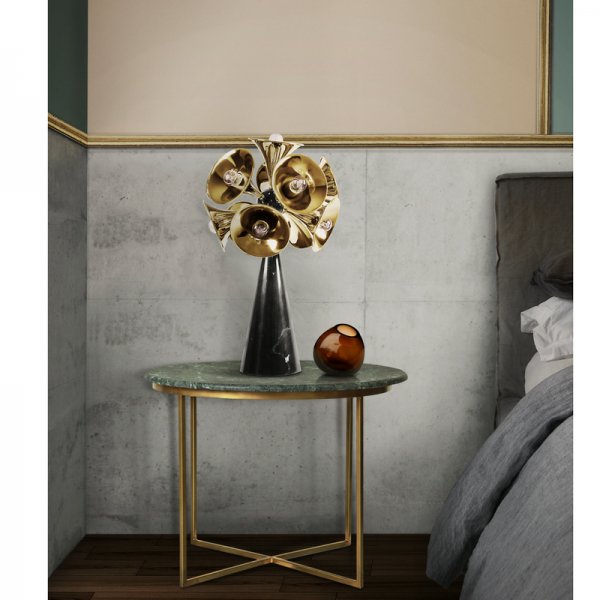 Portugese-based Villa Lumi impressed attendees at the show with its Pendent that stood out not as lighting, but more as a piece of art which one can imagine would sit effortlessly on a mantlepiece, alone, in a quirky hotel lobby. Meanwhile, Voltra Lighting, which was among the stand-out lighting companies that emerged in many of the London fairs in 2018, displayed its new generations of table-level lamps, which created a warm, intimate environment with the subtlety of candlelight – a welcome break from the harsh exhibition lighting. There seems to be a influx in lighting specialists designing products that blend into their surroundings; perhaps this is the result of consumers becoming more savy around lighting and becoming more reactive when experiencing bad lighting (design suicide to many). Delightfull’s Botti sent sound waves of excitement through the hall as it was displayed on the company’s ever-colourful stand. The embodiment of the most famous wind instrument of them all, Botti mid-century table lamp was inspired by a classic trumpet. Its unique shades are handmade in brass with a gold-plated finish to resemble the instrument. The base can be produced in Nero Marquina or white marble, as well as black nickel or any other finish of your choosing. It is a tall table lamp, very hard to miss, with almost 55 pounds, making it the ideal choice for a classic living room design. Attendees at the show questioned the definition of perfection at many areas of the show. What was concluded was that there’s a clean line between precision and perfection. 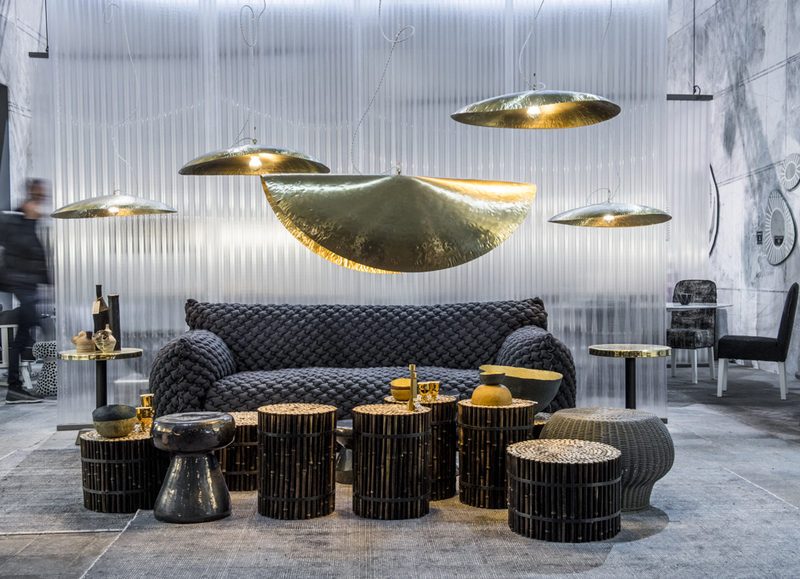 While Tom Dixon’s precise craftsmanship never ceases to amaze new audiences, it was the imperfection that impressed visitors at the stand as the London-based studio unleashed a range of new collections. Swirl, one of the accessories launched at the show, is a mysterious new material that resembles 3D-marbeled paper yet has the weight of a stone. Perhaps the most interesting quality of this product is that no two pieces will ever be the same, giving each product its own personality. Displaying its qualities on apt newspaper was a touch that brought with it class, sophistication and a sense of headline-grabbing drama. 2018 closed with opinions being divided around which colours will dominate over the coming 12 months. While many companies amplify their answer to ‘the colours of the year’, wallcovering expert Arte decided to narrate the story of extinct animals. 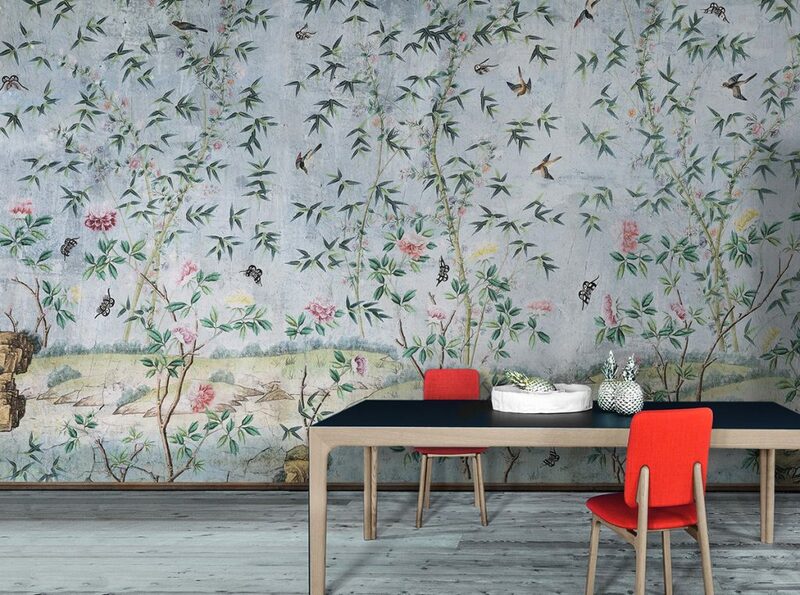 Partnering with Moooi, the company launched Extinct Animals, which brings the walls to life. Launched at its showroom in Saint-Germain-des-Prés during Deco Off, the showroom was a jungle of designers getting up close to animals that time had forgotten. Just down the road at Holland & Sherry’s showroom, the focus was on fabrics, colour and layers. Its signature weaving tradition has come to life in nine elegant handwoven designs. In addition, the showroom presented an array of unique trims that have been purposefully designed to compliment the company’s core fabric collection. Back over at MAISON&OBJET, storytelling took many shapes and forms. From experimental lighting company Lumneo presenting neon mirror lamps to rug company Slinke displaying, as the name suggests, slinky-inspired patterns in pastel colours, each stand had its own narrative to tell. Wallpeper on the other hand took art outside the frame to be able to sustainably display in unique wallpaper. Meanwhile, using denim in a contemporary format, Japanese company Shin-Denim emerged to display a series of hard-wearing products. 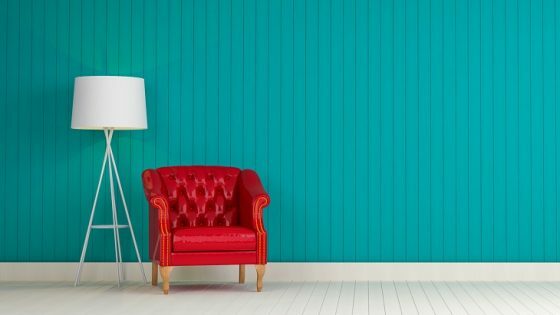 From a residential-styled reclined sofa to a striking wall partition, the material used in this way gave each product an usual, yet fresh, style. 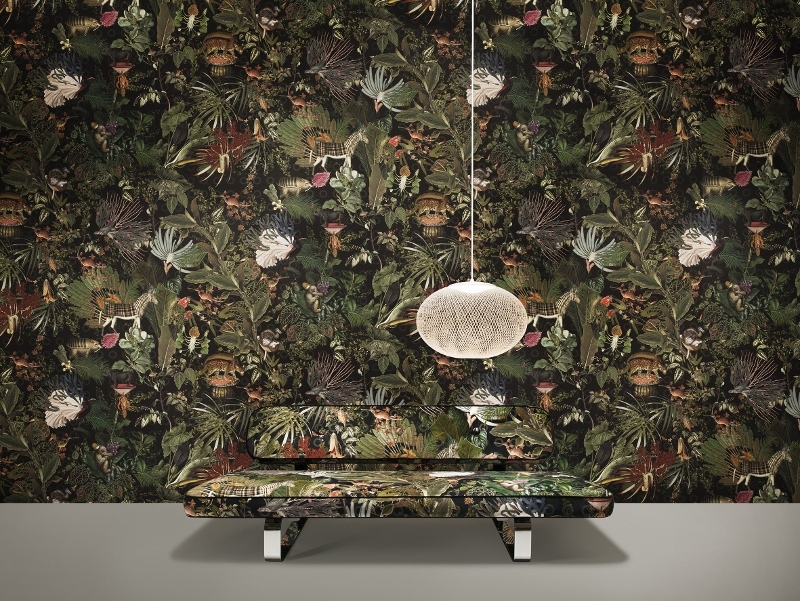 Contract furniture company SCP exhibited a variety of design collaborations from the likes of Piet Hein Eek, Faudet-Harrison, Matthew Hilton, Reiko Kaneko, Phillipe Malouin, Donna Wilson and Jasper Morrison. Meanwhile, Pedrali opted for simple luxury displaying a glimpse of its SS19 collection with its latest modern colour twist on the classic Nolita range. Following on from last year’s dominant trend to blur the lines between areas, many outdoor furniture companies were further muddying the waters by exhibiting indoor-looking outdoor furniture. The designs of which were determined on consumer behaviours, as Hugo de melo Lourenco from Sachi explained: “I don’t look at trends too much, because I prefer to understand behaviour and ergonomics of our products. 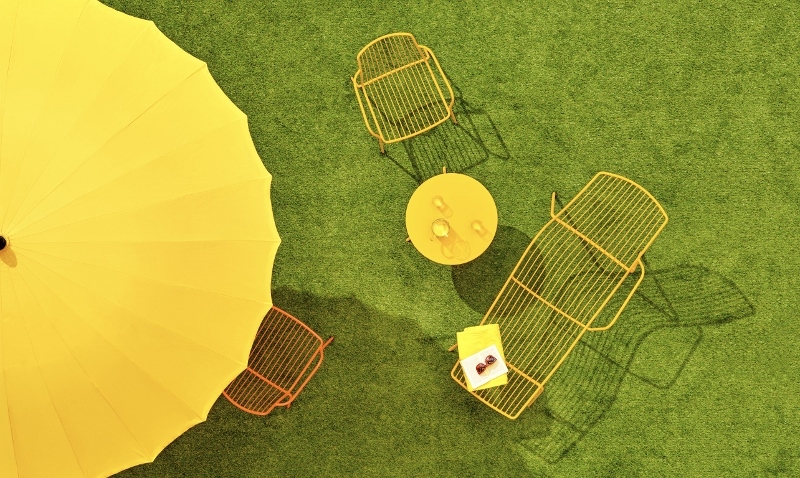 Research has shown us that the luxury market is currently looking for outdoor furniture that is slim and minimalist.” Other companies that displayed new lines of outdoor furniture collections included Skyline Design, 10Deka, Tucci, SUNSO and Mobika Garden. 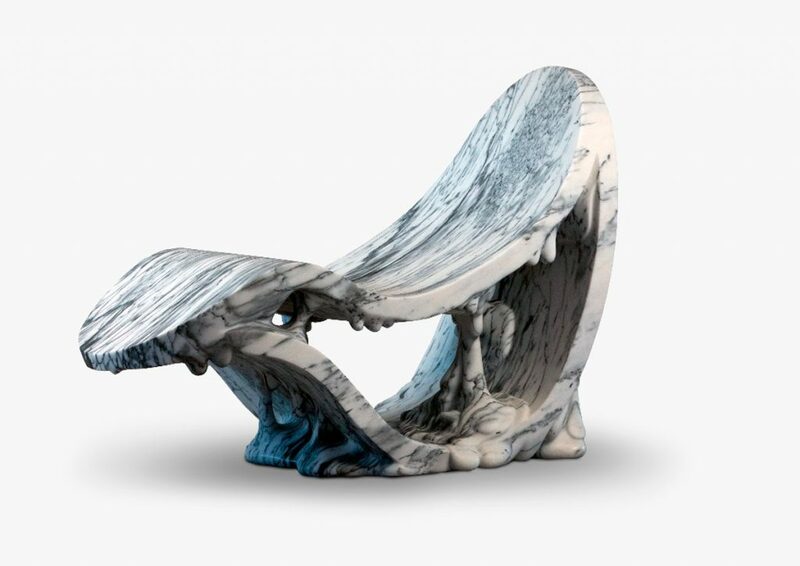 While many exhibitors displayed sun loungers and shade options, handmade stone specialist Manta exhibited something out of the ordinary, an oversized outdoor (or indoor) marble seat as part of the company’s melting collection. The one-of-the-kind product oozed character and a high level of personality. Also adopting the same theme, Domani displayed a large selection of robust outdoor pots which stacked together to demonstrate the scale of different designs suited for a variety of spaces. 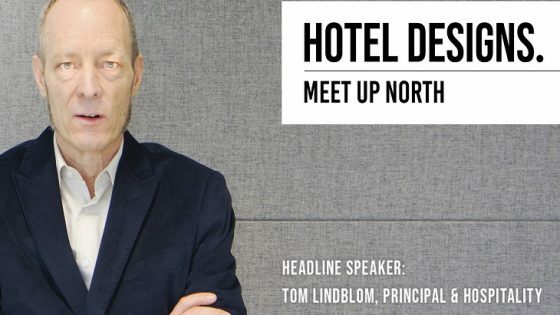 Once again, MAISON&OBJET has set the industry up for an exciting year of developing trends and themes. My time at the show would not be complete without a sneaky exclusive interview with the fair’s Designer of the Year, which this year was awarded the multi-talented Sebastian Herkner. 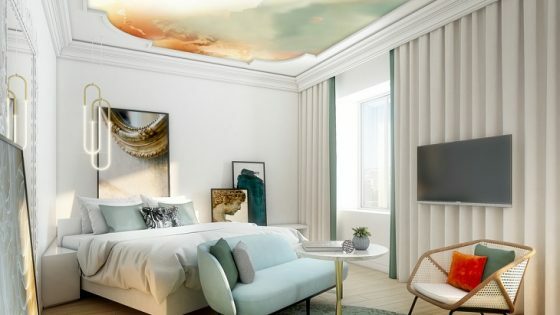 All that is left to say is Bon Voyage, Paris, for another year – the journey into the world of 2019 interiors continues.